Puppet Place is your hub for all things animated on stage and film in the UK. We are dedicated to sharing our passion for puppetry and animation with the wider public and supporting artists and professionals working with these artforms. Our building, on Bristol’s Harbourside, is home to a community of resident companies and artists producing brilliant work in puppetry, animation and the creative sector more widely. 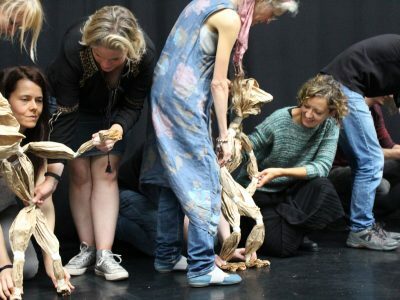 We support the greater puppetry and creative sector through residencies, networking and training. 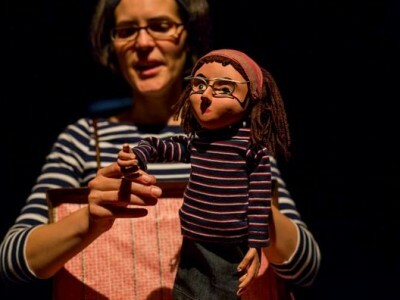 For the public we run events, workshops and activities in Bristol and beyond, including the internationally recognised, Bristol Festival of Puppetry. Check What’s On to find out more. In 2007, four Bristol based companies came together to reinvigorate Puppet Place: Stuff & Nonsense Theatre Company, Full Beam Visual Theatre, Green Ginger and Pickled Image. In 2008, we moved into one half of our current premises, Unit 18. In 2009 we ran the first ever Bristol Festival of Puppetry and decided to continue it as a biennial event. Since then, each festival has grown in ambition and scope. In 2014, Puppet Place developed from a largely voluntary run organisation and we appointed our first Executive Producer – Rachel McNally and started to run activities and events outside of the festival, including workshops, a puppetry prototype and our first international presentation, Stuffed Puppet’s Punch & Judy in Afghanistan, in collaboration with Tobacco Factory Theatres. In early 2015, Puppet Place secured the lease on Unit 18 and took over the whole building, with the support of our previous landlords, Bristol Old Vic. We are now developing our building and our work to provide further support and development opportunities for the puppetry and animation communities in the UK and introduce more people to the wonders of all things animated! Puppet Place would not exist without the support and goodwill of the artistic community in Bristol and we offer them our whole-hearted thanks. Katie is the Executive Producer of Kaleider, a studio based in Exeter, that brings people together to make live experiences, products and services. Mary is a Higher Education Commissioner and strategic education consultant. With over 25 years experience in home and international higher, professional, further and alternative education, Mary is currently Dean of Students at Staffordshire University. She is also an active member of North Bristol Art Trail. Chris is Artistic Director of Green Ginger. 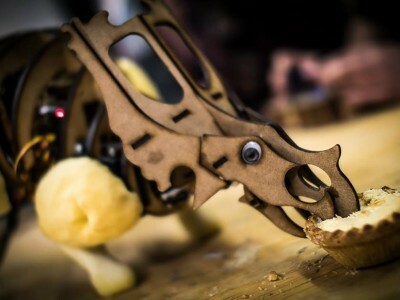 He has thirty years’ experience as a freelance designer and maker of puppetry solutions for screen and stage and is also a lecturer and researcher in puppetry for performance. Laura is Co-Artistic Director of Wattle & Daub Figure Theatre and Senior Lecturer in Drama at Bath Spa University. Rachel is Puppet Place’s CEO. She has previously worked as a producer and tour booker for Full Beam, Pickled Image. Stuff & Nonsense Theatre Company and The Devil’s Violin Company. She is dedicated to promoting Bristol as a city of puppetry and exploring the relationship between puppetry, other artforms and walks of life. With a passion for the Gothic, the macabre and the downright odd, Emma Windsor specialises in stop-motion animation. She produces work as ‘White Rabbit Animation’. Luke is a designer & fabricator whose background is rooted in Fine Art and Interactive design. His passion for puppetry stems from giving movement to the inanimate, creating kinetic, reactive work. Having previously worked in UWE’s Fabrication Centre, and currently within Ashton Park’s Design & Technology department, Luke has vast technical expertise and experience in the arts and education. Hannah has previously worked as an Arts Administrator, General Manager, Social Circus Workshop Facilitator and Fundraiser for a range of arts and charitable organisations in Brighton and Bristol. Hannah is passionate about art created by, for and with younger audiences from diverse backgrounds.